In Synapse you are tasked with taking on waves of attacks from a virus that has been infecting mankind. Scientists have developed a microscopic craft that can be used to engage the virus at its cellular source. In order to defeat the neural virus, you must pattern-match the attack using your dual gamepad sticks. A rating will be given based on your performance. Only those achieving high marks will be accepted into the program. Before you are able to attack the virus, you must unlock the appropriate neural network required to reach it. This is accomplished through solving a logic puzzle. You will interact with a "board" within the game. You will be required to identify the correct connections between neurons. There is only one solution! Synapse takes place in a first person view. The attacking sequences are performed while sitting in the cockpit of the craft. The virus attacks will come directly at you and will require head movement to aim. Each attack sequence has different attack zones and a shield in front of your craft protecting it. If you do not input the correct gamepad pattern (twin stick directions) in time, the shield will be hit and reduced in effectiveness. Once depleted, the shield can no longer protect you, and an additional hit will destroy your ship. A computerized voice talks you through the attack stages and provides feedback on your performance. Be forewarned, she can be a bit harsh (and comical) in her evaluation. Up-tempo music accompanies the environment. The puzzle solving sequence takes place in a medical laboratory setting and will require head tracking and user input via gamepad. 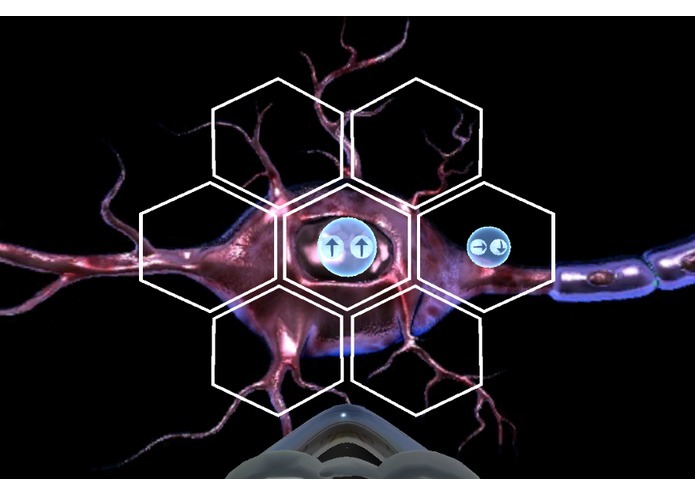 You will interact with a holographic screen which displays a series of neurons. You must use logic to determine which neurons should be connected. 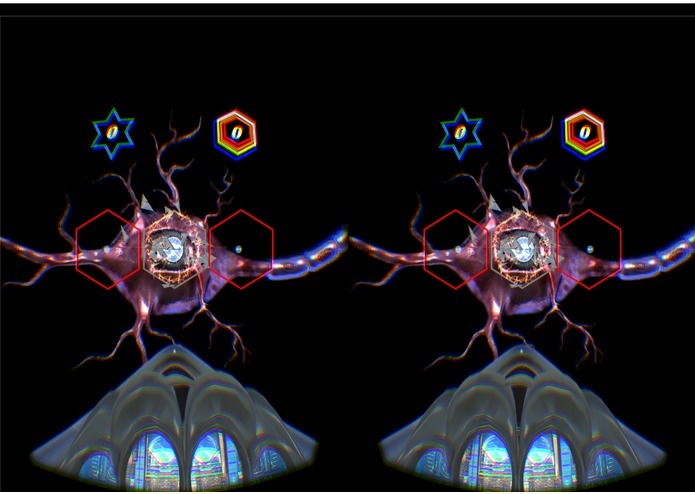 Gazing at a neuron will highlight it, and you can select/deselect using the gamepad. Selecting a neuron in the same row or column will then connect the two. 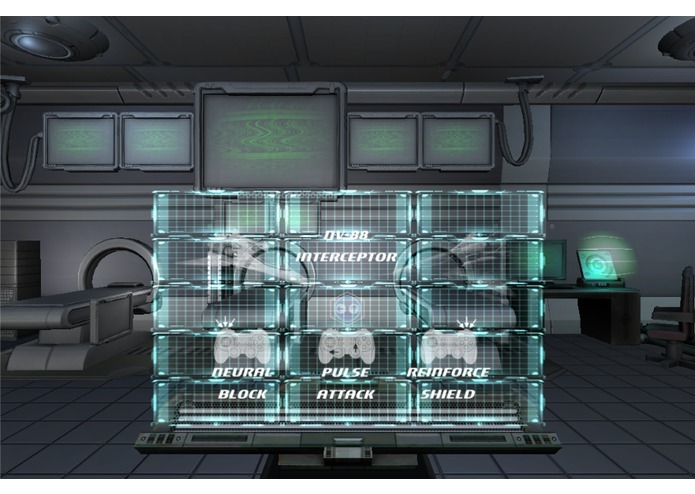 Once all correct connections have been made, the network will be unlocked, allowing the player to enter the associated attack sequence. Calming music accompanies the environment. Instructions and the project backstory are presented on another holographic screen projector in the lab. 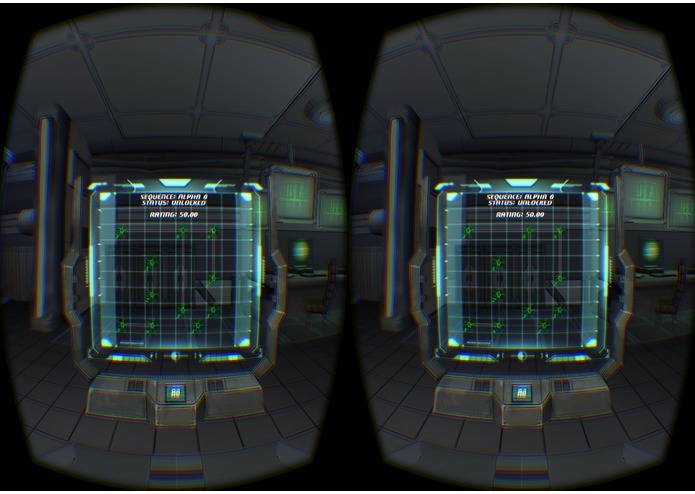 The goal of this game was to comfortably immerse the player in a sci-fi environment through visuals and audio. Alternating calming puzzle-solving and intense reaction-based action sequences bring variety, while level-unlocking and a high-score rating bring a feeling of accomplishment. The game is best played seated, and the gamepad controls are not overwhelming.